Figuring out what you want to do in life seem to be one of the most commonly asked questions in the personal development industry. Many people have lost themselves and they don’t know what they want out of their lives. Plenty of books have been written about the finding our passion and purpose, and there are plenty of self-discovery seminars across the country, but still, a lot of people are still confused with what they want to do in life. If you’re one of these people and you don’t know what to do in life, don’t worry, because this article may be able to help you. It is easy to say that we all want success in life, but what does success mean and how does it look like? To different people, success can mean different things. This is because we are all wired differently. Some value safety and security, while others value adventures and creativity. This is why someone’s wants and desire may not truly reflect yours. If you want to find out what you want to do out of your life, the first rule you must adhere is to ignore others’ opinions and don’t compare. This is your life and you’re the one who’s living it. Thus, you should live your life according to your own terms and conditions, not according to what other people want you to be. So, what did I do? I followed my parents’ advice and listen to what most of my friends told me. I ended up taking a civil engineering course at a local university, to become an engineer in the future. Guess what, I chose the course based on my family’s and friends’ influences. By the way, my father is a contractor who works in the construction industry for decades. Ever wonder why I ended up becoming an engineer now? I’m not saying that family or peer influence is bad, but when it comes to finding out our callings or our purpose or what we want to do in life, we must answer the question from within our hearts. And to do this, we must not allow others’ opinions to influence us. Les Brown, the famous motivational speaker was once labeled as “educable mentally retarded” while in grade school. And because of this, the young Les started his life with low self-esteem and confidence. People even suggested him work in the post office or join the army because he wasn’t smart enough and he should do something more ‘technical’. (Please, being a postman and joining the army have nothing to do with intellect). Guess what, Les believed in others’ opinion about him and thought that he was not good enough and he would amount to nothing. From then on, Les Brown chose to believe in himself and that he could do it in life. He trusted that he could do better in life and he deserved to achieve amazing success like all others did. And he did. Today, Les Brown is a famous motivational speaker and he has been traveling and speaking around the world. His story has touched and inspired millions, including me. Hence, lesson #1, if you want to find out what you want to do in your life, never listen to others’ opinion of you and don’t compare with others. Once you understood this basic rule, then, it is time to discover your passion, your calling, and what you want to do out of your life. There are 7 strategies you can use below. Each of them has their own pros and cons. And you can try out all of them if you want to. Some methods may require more time to implement than others. After all, finding your purpose and what you want to do in life is not a sprint, but a marathon. So try to put in as much time for each method. What you want is to truly understand yourself, this is not a competition. My friend, take your time and go slow for each method. You don’t have to rush, and there’s no time limit. Just enjoy and immerse yourself in the progress of self-discovery. When you found out what you want to do with your life, you’ll become unstoppable. I first learned the concept of “Blue Sky Thinking” from Brian Tracy’s Goals Mastery Program. It is a powerful goal setting program that sets to transform your life and to achieve what you truly desire in life. It is a thinking where you become limitless and everything is possible. This is a great concept to brainstorm and envision yourself into the far future so that you can discover what you want out of your life. I need to work hard to earn $XXXXXX to support and live the life I want. My wife will never allow me to work on this. I need to spend more time with my children and family. I will be too old by the time I achieve my goal or make this change. I don’t have what it takes and I’m just no good with technical skills. I don’t have a product and I don’t know how to create one. I don’t have time to exercise, let alone to start an online business. I’m overcommitted and in debt, so I don’t have the capital to start. The above are some of the most common limits that stop us from envisioning the future that we want. And this is why the Blue Sky Thinking is important. You have to get rid of these assumptions and limits in order to find out what you truly want out of your life. Let us look at each of them in detail. This is one of the most powerful questions for self-discovery. Most of our limits and assumptions are due to our financial constraints. And when we take money out of the game, we allow ourselves to think better without limits. So what will you do if you have $100 million dollars in your bank account right now? Are you going to distribute the money? Will you share a portion with your family members? Are you going to donate some to the charity? Now that you have $100 million, will you still work in the same company you used to work? Are you going to start a business? What business? Will you take a vacation to Hawaii or visit Hokkaido in Japan? Will you visit the car showroom tomorrow and buy yourself your dream car? Are you going to start a blog and share with the world your travel experience? Do you want to become a YouTuber and an online celebrity? Will you continue to stay where you are or move to another city or remote location? Will you still cook yourself a dinner because you love doing it or are you going to hire someone to do it? These are just some of the questions to spark your creativity. Now, take this exercise seriously. If you truly want to find out what you want to do in life, you must be serious about it. Take out a pen and paper, and write down your thoughts. What will you do if you have $100 million in your bank account right now? Stop telling yourself that this is not going to happen to you or this is not real, the $100 million is just a thought that is used to take your financial limit out of this exercise. I believe that all of us have limits and financial commitments in life. And due to these constraints, we often become too ‘realistic’. We tell ourselves that visiting Hawaii is not possible because we don’t have the budget or we don’t have the time because our leaves will never be approved by the HR. Forget all these constraints or limits that are stopping you. Now that you already have $100 million in your bank, you can live your life according to your own terms and conditions. Are you going to wake up at 6AM each morning or sleep until you wake up automatically? Are you going to live a lavish lifestyle or do you prefer a frugal lifestyle? My friend, just imagine that you have $100 million and money is not a problem at all, the question is, what will you do? Be serious, write down your answers. Let your brain come out with the answers that have been stored deep inside you. Lifehacker also has an article published about this exercise. You can read it here. The reason why 5 years is because the 5-year timeframe is not too long and not too short either, it is just nice to describe what and where we want to go in the future. If you try to imagine where you will be in the next 20 years, the answer may be too vague and you may lose direction of where to start. And if you imagine where you will be in the next year or 2, the answer may not truly reflect what you want, instead, it will be based on your current life circumstances because the timeframe is too short. Therefore, 5 years is a nice timeframe to begin with. Do this exercise like the $100 million dollar question, write down your thoughts. Where do you see yourself in the next 5 years? Will you still be in the same company working at the same job? Or have you started your own business? Will you still be living where you are or you have moved to another place? Will you still be driving the same car or have you changed to a newer and more luxurious one? It doesn’t matter if your answers are too realistic or unrealistic, the key is to do the exercise so that you will find out an idea of what you want to do with your life. What you want is a roadmap. And often, you will get an incomplete roadmap, but it is alright because you already know and discover your destiny. That is the most important thing. You want an idea, a draft, and a vision of what your life will be in the future, not a vivid or a detailed plan to achieve what you want. So, where will you be and what will you be doing in the next 5 years? If you read the best-selling book from Stephen Covey, The 7 Habits of Highly Effective People, you will understand that one of the principles is to begin with the end in mind. “It seems so old-school. But the inarguable fact is there are always two creations to everything you see or experience. The first creation happens in your mind—it’s where you envision what you want to accomplish. And the second is when you align your actions to your imagination. Now, you understand why it is important to begin with the end in mind. In order to achieve something, you have to understand what that ‘something’ is before you can achieve it, right? And finding out that ‘something’ is your mission here. Ted Leonsis is a successful entrepreneur, a former senior executive with AOL, the founder, chairman, and CEO of Monumental Sports & Entertainment, and also the Vice-Chairman of Groupon. A couple of years ago, Leonsis was on a near-death flight when the pilot announced that the plane he was in was in serious trouble, all the recovery measures have failed, and the passengers onboard have only about 37 minutes left to live. Can you imagine what will you do if you’re one of the passengers on that flight? Have you prepared? Well, at this moment, many will prepare to die and think of nothing, but not Leonsis. He prepared to live. He reflected on what truly mattered and all the potential and things he still had left to do, achievements he still had to experience, and also the joys and happiness he had still left to taste. The plane did not crash. And after it landed safely, Leonsis reflect on the experience and came up with his “101 Things to Do Before I Die” List. The story of Ted Leonsis’ near-death experience in the plane crash that led to his awakening and reckoning was covered in this article by Washington Business Journal. So far, Leonsis has accomplished and checked off 74 out of his 101 to-dos on the list. The key is that he is living a successful, a life that he loves, and a life that he “engineered”. Therefore, you can do the same. 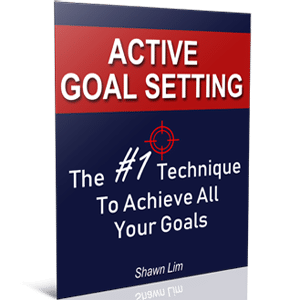 Come up with your 101 goals or target or to-do’s before you die. I bet that you must be eager to find out what are the 101 items on Ted Leonsis’ list. It’s your lucky day, Leonsis did share his list with the world from his website at Ted’s Take. You can read his blog post and see his 101-list here. Robin Sharma is one of the most respected success gurus out there. He is my hero and I love his way of teachings. After you watched the video, you will understand why sometimes, it is crucial to remember the end. Your purpose, your goals, and what are truly important to you. So what does finding out what you want to do in life have something to do with dying? Well, start with the end in mind. It is a great technique to reflect on your life and about what you want out of life. When you have only a year left to live, how will you live it? Will you still complain about life and the traffic? Will you still go to work as usual? Will you spend more time with your spouse and family? Are you going to enjoy each moment? You see, as human beings, we take things for granted, especially our lives. We fall into the trap that there is always a tomorrow, and hence, we ignore the important and truly valuable things in our lives. We spend too much time playing games and checking updates on social media rather than having precious moments with the people we love and care. We complain about the traffic, the weather, our boss, and our colleagues when we get to work, but we never look at ourselves at all. However, when we think about death, it can be an experience like what Ted Leonsis went through or like what Robin Sharma suggested, take a walk in the cemetery, we will then discover that life is too short. And suddenly, we realized that we shouldn’t complain about the traffic or blame our colleagues, because these are puny matters. Remembering our death and that life is short can serve as a great awakening to finding out what we truly want from our lives. Another great strategy to discover your life purpose and what you want out of your life is by creating a personal manifesto. It may sound a little odd to create a personal manifesto, but nothing sounds more awkward than visiting the cemetery like Robin Sharma suggested, right? Anyway, creating your own personal manifesto is an idea that if you figure out where you stand on certain ideas, you may be able to craft out a possible career or life that you want. Just take it as your call to action, or your policy when it comes to how you want to deal with things in life. “I read my manifesto every day, before I start my job. It focuses my mind by reminding me of my priorities. I deal with topics like how I want to treat my girlfriend, how I want to work honorably at my job, how I want to vote, and every day I am reinforcing those values. Over and over and over again. If it is hard for you to understand what a personal manifesto is, just take it as a list of life’s rules. Yes, your personal manifesto is like life’s rules. What should you do, how should you do, when, and where to do it. You have to understand that these principles or manifestos are there to help you shape your life and the way you live. They are great rules that you want to follow because they define who you are. And in this case, your personal manifesto can help you discover who you really are and what you care about in life. It tells you how you perceive others, yourself, and the world around you. It shows you how you want to act and where are you moving toward in life. I know that having a personal manifesto may not directly give you the answer to what you want to do out of your life, but it is a great way to start. After all, finding out how you want to live your life gives you a great idea of what you want to do with your life, isn’t it? The “Test the Water” approach is easy to understand. Well, how do you know if you are passionate about something? Just do it, and you will have the answer. The “Test the Water” approach works the same. You test out something to see if you really love doing it. So if you don’t know what to do in life, just test out things. You will never know how the cookies taste and you’re not sure if you’re going to like them, the only way to find out is to test it out. Eat it, and you will know. This is common sense. But I first learn about it from Harv Eker, the best-selling author of Secrets of the Millionaire Mind. According to Harv Eker, when he wanted to start his own business, he has no idea what to do, but suddenly, an idea hit him, “selling pies”. Thus, he wanted to open a pie shop. The problem was that to open a brick-and-mortar shop requires a lot of capital, time, management, effort, and logistic. It won’t be an easy thing to do. And what if the business did not work out in the end? What if Harv did not like pies after all? Hence, Harv decided to test out the water. He decided to learn about the business by working in a pie shop in his neighborhood. Clever, huh? Guess what, after 2 weeks of having a glimpse of learning how to bake the pies, cleaning the kitchen, running the business, etc, Harv found out that he did not like the idea of selling pies at all. In the end, he decided to ditch the idea of open a pie shop, instead, he chose to go into the fitness industry, which led him to a big business success. I believe you know how the “Test the Water” approach function. Don’t know what to do in life? Just test things out. I have heard many people saying that they have no idea what they want to do in life. Most want to start a business, but they have no idea what business to go into. Some want to build a blog like me, but they have no idea what niche to start. If you are having the same dilemma, my suggestion to you is this: Just do it, do something, anything. A lot of people choose to brainstorm and think about what they really want to do in life. Let me tell you something. If you’re going to just sit there and think about what you want to do in life, you will never find the answer. The reason is simple, if you sit down and think for a week without doing anything, what you know right now and what you know a week ago is the same. Do you get me? If you want to start an e-commerce business because it is a hot trend right now, but you have no idea what to sell and you decide to spend a month thinking about what to sell, highly likely, by the end of the month, you will still have no idea what to sell. The only way to expand what you know is by doing it. Even if you choose to read a book, you’re going to discover OTHER PEOPLE’S DESIRE, not yours. You can feel extremely motivated and inspired to start an online business after reading a book about how someone who went from rags to riches by building an e-commerce business selling shoes, but that’s him, not you. Perhaps, he loves shoes, but you don’t. This is why merely thinking and reading are not enough. You will never discover what you want to do by just thinking about it. You need action. You need to do something, anything. And as you do, things will come to you. You will understand what work and what doesn’t work. Eventually, your choices, your decisions, and your life events will lead you to the place that you want to go, your calling. By then, you will have discovered what you truly want to do in your life. So stop thinking, and start doing. Self-assessment is another great method to find out what you want out of your life. You can understand yourself better by going through self-assessment exercise. When you know yourself better, it gives you an idea of what you want to do with your life. If you love helping others, perhaps, you can join a non-profit organization to find out more about your interest. If you love technology and internet, then maybe starting an online business can be a good place to start discovering your calling. There are plenty of self-assessment tests and quizzes you can take online to find out your strengths, your weaknesses, your personalities, and some even give you an idea about what you want to do out of your life. The problem is that most of the tests and quizzes require you to pay or opt-in your email to do it. And I don’t like that. The assessment takes about 3-4 minutes and covers the major areas of your life. And upon completion, you will receive a personalized assessment of your life. I like this quiz. It is created based on personality science according to 7 “striving styles,” modes of thought and behavior that direct us to seek satisfaction in different ways. Noomii.com is the web’s largest directory of life coaches and business coaches. And the wheel of life assessment provided allows you to see the performance in all areas of your life. You can improve where you’re weak, and you can continue to work on areas where you’re strong too. This wheel of life assessment may not give you a direct answer of what you want to do in your life, but it does give you an overview of where you are right now and where you should improve in the future. This is actually a checklist in which when completed, will give you a complete personal freedom. There are 100 items grouped into 4 categories, physical environment, wellbeing, money, and relationships. So did you manage to go through some of these quizzes and assessments? These tests may not give you a clear-cut idea of what you want out of your life. In fact, I believe that no one and no program or assessment can help, including me and this article. You can only discover what you truly out to do in life on your own. What we can do is to provide you the guidance. This article and all the information I shared here are only guidelines and they work as a lighthouse to show you the way, but the one who takes on the road will be you, and none others. Only you will know what you want to do in your life. Questions are powerful. And we all know that. Whatever we ask in our head, our brain will search for the answers. Therefore, if you ask the wrong question, you will get the wrong answer. On the contrary, when you ask the right question, you will get the right answer. As simple as that. So what answers do you have? What did your mind tell you? What are the thoughts that come to you? I bet they are not positive. When you ask this question, your brain will search for all the reasons why you think you’re always bad luck and show them to you. You will find all the positive and encouraging answers. Our brain is an auto-suggestion machine. And we can take control of our thoughts by asking questions. When we ask, our minds automatically search for the answers. It works exactly like how Google works. And it all depends on what you key in to the search bar. You can search for positive things, and you can also search for negative things. The choice is yours. So what kind of self-discovery questions can you ask to find out more about yourself and understanding what kind of life you want to have? This is an article from More-Selfesteem.com and in my opinion, the article gives a great insight into asking some powerful questions that spark your imagination and creativity to find out more about yourself. What are the biggest successes in my life that I’m most proud of? If I get into a huge bookstore, which section do I visit and spend the most time on? If anything is possible, what will you do and how you want your life to be like? Who are the 3 people you most respect and admire? Why? What are the things that you hate to do or don’t like doing? What has to happen in order for me to feel successful and that I’m living my life to the fullest? What’s the one thing I can do to live my potential and to feel that I’m truly living? Asking questions is easy, the difficult part is in answering the questions in written form. Yes, take out a pen and paper, and jot down your thoughts. The best is to keep a personal journal to write down all these answers, record your thoughts, and also write down your goals. The impact will be small when you just try to answer those questions in your head. But when you write them down, you are telling yourself that you are serious about finding yourself; you are committed to discovering what you want in your life. Thus, spend a few minutes or even hours to do this. You can do it Starbucks if you want to. Make sure you schedule and block your time to do this. Finally, when you have no idea what you want to do in life, what career you want to be in, and feel directionless, you can always learn from your daily life. Look closely at how you make decisions, how you do things, and what you do most of the time. Life will give you hints and signs about what you want. Maybe you’re good at cooking and baking. Or perhaps you love talking to people and you love to meet new people. Can it be that you’re good in sports, like in tennis? Or have someone told you that you’re good in teachings and sharing your knowledge with others because you’re patience? Did someone tell you that you have skills in designs and suggests that you should go into interior design? Well, these are some of the hints that life have shown you. Listen to them, and then evaluate if these signs are going to be helpful in finding yourself. In many cases, people found out what they want to do from their free time. When you’re free, what kind of side projects you’re interested in? And what do you do most of your free time? Do you learn to design and build a website of your own? Do you read recipe books and learn how to bake a chocolate cake? Do you go hiking because you love it? Or do you watch YouTube videos about organic gardening? Pay attention to your hobby and things that you enjoy doing. What are your passions? “Instead of making definite decisions about a career path, I believe you should get curious. Get curious about the way the world works. Notice your own interests and find small ways you can exercise passion in something. Even if you can’t find a way to make money off of it yet. That’s exactly what you need to do to learn about yourself, your life, and of course, to find out your calling in life. Remember, pay attention to your surroundings. Listen to what life is telling you. When you don’t know what to do in life and have no clear direction of where to go, remember these 7 methods. Finding your calling is not a destination, but a process. Thus, have patience. It is alright that you feel lost and have no idea what you want to do in life. After all, life is a process of finding out what you want to do, in life. Let me know what you think about this article. Do you think that these 7 methods are helpful? Share your opinion in the comment section below. I’d love to hear from you.